Tatlin Tower. Model of the Monument to the Third International. For architecture, see Constructivist architecture. Constructivism was an artistic and architectural movement in Russia from 1913 onward (especially present after the Russian Revolution of 1917), and a term often used in modern art today, which dismissed "pure" art in favor of art used as an instrument for social purposes, namely, the construction of the socialist system. The term Construction Art was first used as a derisive term by Kazimir Malevich to describe the work of Alexander Rodchenko in 1917. Constructivism first appears as a positive term in Naum Gabo's Realistic Manifesto of 1920. Constructivist artists attempted to create a new type of utilitarian art that would help educate the masses into the proper socialist sensibility and inculcate the values of the newly emerging Soviet socialist system. Like a lot of avant-garde movements of the era, it attached itself to the fledging Soviet state, but would ultimately come to be rejected during the era of Stalinism, as the more kitsch style of socialist realism gained ascendancy over the more revolutionary avant-garde approaches. The movement began with developments in architecture and the visual arts. Its driving influence was initially Vladimir Tatlin, and later prominent constructivists included Joaquín Torres García, Manuel Rendón, Antoine Pevsner, and Naum Gabo. The basis for the new movement was laid by People's Commissar of Education Anatoly Lunacharsky with the suppression of the old Petrograd Imperial Academy of Arts and the Moscow School of painting, sculpturing, and architecture in 1918. The focus for Constructivism in Moscow was VKhUTEMAS, (Russian: ВХУТЕМАС, Высшие художественно-технические мастерские, an acronym for Higher Art and Technical Studios), the Russian state art and technical school founded in 1920 in Moscow. In 1926 its name was modified: "Institute" instead of "Studios" (ВХУТЕИН, Высший художественно-технический институт). It was dissolved in 1930. Gabo later stated that teaching at the school was focused more on political and ideological discussion than art-making. Kazimir Malevich also worked in the constructivist style, though he is better known for his earlier "suprematism" and ran his own competing group in Vitebsk. The movement was an important influence on new graphic design techniques championed by El Lissitzky. As a part of the early Soviet youth movement, the constructivists took an artistic outlook aimed to encompass cognitive, material activity, and the whole of the spirituality of mankind. The artists tried to create art that would take the viewer out of the traditional setting and make them an active viewer of the artwork. Most of the designs were a fusion of art and political commitment, reflecting the revolutionary times. The artists of the movement were influenced by, and used materials from, industrial design such as sheet metal and glass. Often these materials were used to create geometrically-shaped objects, which were in keeping with the utilitarian artistic vision of the movement. 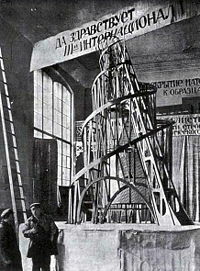 The canonical work of Constructivism was Tatlin's proposal for the Monument to the Third International (1920) which combined a machine aesthetic with dynamic components, celebrating technology such as searchlights and projection screens. Gabo publicly criticized Tatlin's design saying Either create functional houses and bridges or create pure art, not both. This led to a major split in the Moscow group in 1920 when Gabo and Pevsner released the Realistic Manifesto that asserted a spiritual core for the movement. This was opposed to the utilitarian and adaptable version of Constructivism held by Tatlin and Alexander Rodchenko. The Constructivists main political patron was Leon Trotsky but after 1921 his support began to decline—the Communist Party could not afford to support a pure art movement, and as early as 1918, the newspaper Pravda, the official organ of the Communist Party, had complained that government funds were being used to buy works by untried artists. To distance themselves from Gabo, Tatlin and Rodchenko began to use the term "Productivism." In 1921, the leadership of the Communist Party adopted the New Economic Policy (NEP) which allowed a certain amount of private enterprise in the Soviet Union. Rodchenko, Varvara Stepanova, and others were contracted to create advertising for commercial enterprises. The poet-artist Vladimir Mayakovsky and Rodchenko worked together, calling themselves "advertising constructors." Together they designed eye-catching images featuring bright colors, geometric shapes, and bold lettering. The lettering of most constructivist designs is intended to create a reaction, to function on emotional as well as substantive levels. A number of Constructivists would teach or lecture at the Bauhaus, and some of the VKhUTEMAS teaching methods were taken up and developed there. Gabo established a version of Constructivism in England in the 1930s and 1940s that was taken up by architects, designers and artists after World War II (such as Victor Pasmore and John McHale). Joaquin Torres Garcia and Manuel Rendón were monumental in spreading the Constructivist Movement throughout Europe and Latin America. The Constructivist Movement had an enormous impact on the modern masters of Latin America, such as Carlos Merida, Enrique Tábara, Aníbal Villacís, Theo Constanté, Oswaldo Viteri, Estuardo Maldonado, Luis Molinari, Carlos Catasse, and Oscar Niemeyer, to name just a few. Deconstructivist architecture by architects Zaha Hadid, Rem Koolhaas and others takes constructivism as a point of departure for works in the late twentieth and early twenty-first centuries. Zaha Hadid in her sketches and drawings of abstract triangles and rectangles evokes the aesthetic of constructivism. Though formally similar, the socialist political connotations of Russian constructivism are de-emphasized in Hadid's deconstructivism. Rem Koolhaas' projects recall another aspect of constructivism. The scaffold and crane-like structures represented by many constructivist architects, return in the finished forms of his designs and buildings. Heller, Steven, and Seymour Chwast. Graphic Style from Victorian to Digital. New ed. New York: Harry N. Abrams, Inc., 2001.